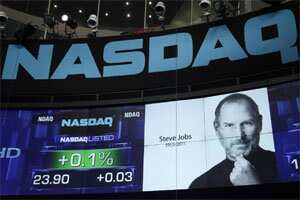 Steve Jobs will perhaps be best remembered for the industry-disrupting technologies and devices he built as co-founder and chief executive officer of Apple Inc. Apart from his huge impact on the computing industry, the Silicon Valley entrepreneur has left an indelible mark on the music and mobile phone industries. Besides, through the computer animation work of Pixar Animation Studios Inc., now owned by The Walt Disney Co., he has had a large influence on the movie-making business as well. But Apple’s major gains have accrued since Jobs’ return to the helm in July 1997, about 12 years after he was fired by the company he had founded. Since then, the company’s shares have gained at an annual average rate of 39%, at a time when the S&P 500 has grown at an annual rate of just 1.5%. Also note that during this period of a little over 14 years, the MSCI Emerging Markers Index has risen at a rate of only around 3%. In other words, investors that stuck with Apple’s strategy of building disruptive technology not only reaped handsome gains, but also returns that beat most investing styles. Apple shares have risen at an annual average of 17% in the past four years, at a time when the S&P 500 has fallen at the rate of 8% in each of these years. Apple has come out shining even through the financial crisis. It’s also important to note here that Jobs had invested only $10 million (around ₹ 49.2 crore today) in acquiring and building Pixar in February 1986. When he sold it 20 years later to Walt Disney in a share swap, his stake in the company was valued at $4 billion, having grown at an annual rate of 35%. While all this sounds good in hindsight, the difficult part for investors, of course, is to identify the right companies that are pursuing disruptive technology. For that matter, even an investment in Apple shares wasn’t considered a great investment for years since its initial public offering. It’s only in recent years, after the success of its music devices and mobile phones, that returns have been high. With many technology companies, investments in research have far outweighed the returns. Yet, as Apple’s and Pixar’s examples show, investing in firms that have a technology edge can generate returns few other investment styles can beat.